Bitcoin Press Release: Matchpool have announced a more than $50 000 development contest, where entrants will develop an MVP QTUM app for Matchpool’s platform, for the Asia area. The winner will be announced February 18th 2018. 9th January 2018 – Tel Aviv, Israel: After a successful launch, community/connections network Matchpool seek to develop their Asia outreach, developing the QGUP model specifically for this market. Asia is extremely important to the crypto ecosystem, and Matchpool care a lot about growing their presence in Asia, and believe running a competition to develop an app will provide them with sufficient coverage! The contest is called “QTUM Dev Challenge”, a contest to develop the QTUM version of Matchpool in Asia that will use $QGUP as its’ currency. It is expected that experienced developers the world over will enter, and an opportunity to compete alongside the best is rarely as accessible as this. What are Matchpool Looking for? Primarily, Matchpool are looking to develop a social app. They recognise the importance of social media and how pervasive it is on everyday life. For a platform which has large goals, and a vision of worldwide adoption, viral marketing and platform basis is the way to go. The team that develops the best MVP for the app will win a $50,000 cash prize as well as 5% of all $QGUPs. Pretty awesome, right? So what are you waiting for? The competition opens on 8 Jan 2018 and will run through 15 Feb 2018. Once the winner is announced, Matchpool will award the prize of 5% of all $QGUPs (vested with 18 monthly payments) once the MVP is complete. The $50,000 prize (delivered in cash or $QGUPs) will be paid in 4 monthly payments upon MVP delivery. May the best team win. The Matchpool vision is to create and give everyone matchmaking tools that incentivise positive connections between people all over the world. Matchpool uses cryptocurrency payments as a means for incentivising the communities to provide value to the rest of the network. Matchpool gives community owners and members a means of being appreciated Our vision is to create and give everyone matchmaking tools that incentivise positive connections between people all over the world. Matchpool uses cryptocurrency payments as a means for incentivising the communities to provide value to the rest of the network. We want to give community owners and members a means of being appreciated for content or actions that benefit the members inside the network. We will offer products that provide solutions for community owners to run successful businesses. Matchpool is the source of this content. Virtual currency is not legal tender, is not backed by the government, and accounts and value balances are not subject to consumer protections. This press release is for informational purposes only. The information does not constitute investment advice or an offer to invest. The post The QTUM/Matchpool Developer Challenge: Win $50,000/ 5% $QGUP Market Share appeared first on Bitcoin PR Buzz. Bitcoin Press Release: Voise have formed a strategic partnership with Bitcoin PR Buzz, one of the biggest Blockchain PR companies in the space. January 9th, 2018: Voise is pleased to announce an official partnership with Bitcoin PR Buzz, heading into 2018. The new year will bring about big developments within the music industry and blockchain technology, this partnership will help bring Voise’s innovations to the forefront. It is clear that the music industry has suffered greatly following technological advancements in the digital era. The business of recording and selling music to audiences was once a mighty revenue stream, that is not the case anymore. However, a solution has now been developed by Voise. Introducing Voise – a revolutionary decentralized music streaming platform, built around the Ethereum token, (ETH), utilising the world’s first Masternodes on the Ethereum blockchain. This is a completely new financial ecosystem designed to allow musicians to reap the rewards of their recording sales, and benefiting fans and fellow musicians in the process. Voise utilises Voise Ethereum tokens – a buyable, sellable, and tradeable currency, that may be bartered for other forms of currency. This totally new financial structure matters as when musicians succeed, Voise tokens can rise in value, benefiting everyone who owns, sells or is being paid in Voise tokens – all without involving a middle man. What is Bitcoin PR Buzz? Bitcoin PR Buzz is the world’s first cryptocurrency and blockchain PR agency. With over 4 years experience and over 500 clients, their press release services include guaranteed publication on CryptoCoinsNews, The Merkle, Coinspeaker, CoinIdol, many international BTC news sites, and 200–400 other online news outlets including Nasdaq, MarketWatch, Yahoo Finance, Digital Journal, International Business Times, Boston Globe, Forbes, Bloomberg, and much more. The post Voise Signs Partnership with Bitcoin PR Buzz Agency appeared first on Bitcoin PR Buzz. Bitcoin Press release: Blockchain startup BCDiploma has announced its unique one-click diploma and data certification service. 8 January, 2017, Paris France – BCDiploma presents a breakthrough proposition landmarking the best of Ethereum to offer a unique one-click diploma and data certification service. BCDiploma is an innovative framework that allows to certify data and share it through a simple URL link. Learning establishments from around the globe face an epidemic of increasing degree falsification and forgery worldwide. Stakeholders in the Education sector are willing to offer their graduates an innovative digital tool aimed at defending their brand. It is also imperative that HR professionals have a reliable way to check the integrity of a candidates diploma. Renowned institutions are following this technological evolution, avoiding forgery and degree counterfeiting. School and universities are now ready for adoption of this blockchain degree authentication service, Engaging their mission to bring a solution adapted to the issues they are facing, as forged certifications are strongly hurting their reputation and businesses. BCDiploma’s technology is not based on hash technology to authenticate the diploma. Instead, its innovative technology stores the diploma’s data directly in the Ethereum’s blockchain. Certificating the school’s identity using DApps, Storing the diploma content and data on the public blockchain ledger. Therefore any industry is guaranteed to retain access to data and DApps forever. BCDiploma is offering schools and universities a turnkey solution and a transparent access to blockchain technology, No specific blockchain knowledge is required to use the service. Considering they respect personal data legislation and the “right to be forgotten”, as they are reliable and sustainable, on-chain registers have a huge potential: certifications, regulated occupations, company and administrative documentation. Application fields are limitless. Anyone can easily use the BCDiploma authentication service. The cost per certification will be approximately 1.5USD without a subscription or recurring fee. The service will be free for graduates and for anyone who consults the diploma. No Ethereum address required. European General Data Protection Regulation body, which will become enforceable 25th May 2018, is now the new reference text on personal data protection and will become applicable globally. The innovative solution developed by BCDiploma is already compliant with these new regulations. BCDiploma is the first use case of the EvidenZ framework, designed to certify all kinds of data: certificates of competence diplomas, certificates, professional registers, administrative data. The fields of application are countless, and EvidenZ’s simplicity of use aims to set it as the standard of certified data. BCDT token is a utility voucher for BCD framework. BCDT are used to pay certified data issuance like diplomas, professional certifications, certificates of insurance or proprietary certificate through BCD smart contracts. Anyone can get its entity certified and use the service with the token. For each and every verified data issuance, the BCD smart contract will burn a percentage of BCDT tokens automatically. BCDiploma token presale is a unique opportunity to take part in the future of certified data with a 20% bonus. Presale is now live and will end on January 18th. For further information visit www.bcdiploma.com and register in order find out further information and upcoming events. The post BCDiploma: The Unique Opportunity To Take Part in The Blockchain Data Certification Revolution appeared first on Bitcoin PR Buzz. Bitcoin Press Release: Lucyd have announced a strategic alliance with Gravity Jack as we move into 2018. Gravity Jack will begin development of new augmented reality apps for Lucyd, thus proving advantageous for both companies. January 6, 2018, Singapore: Lucyd – The AR smartglass and software developer, is pleased to announce the formation of a strategic alliance with Gravity Jack to develop AR apps for Lucyd’s smart glass platform. Since being founded in 2009, Gravity Jack has grown into one of the most respected digital agencies in the world, offering fully-custom mobile apps, augmented reality, virtual reality, 360º video experiences, computer vision and more to a wide and ever-growing range of private, commercial and defense clients. To learn more please visit https://www.gravityjack.com/. Lucyd has created 100,000,000 LCD Tokens, 50,000,000 of which will be available during the sale. The fundraising goal is $10,000,000, with a soft cap of $1,5000,000. LCD tokens will be available at the price of $0.25 per LCD. Team tokens will be locked for a 12 month period, and any unsold tokens will be burnt. Lucyd has a schedule of bonuses for those contributing to the ICO. Reservations for the beta Lucyd Lenses, give the purchaser the opportunity to exchange 5,000 LCD tokens for one early release pair of smartglasses, which are available in early 2019. $1,200—10% LCD bonus, automatic reservation of 1/500 beta Lucyd Lenses. $3,000—15% LCD bonus, beta Lens reservation. $6,000—20% LCD bonus, beta Lens reservation. $9,000—25% LCD bonus, beta Lens reservation. $18,000—35% LCD bonus, beta Lens reservation. The top 50 donors will receive 1/50 platinum-colored “Legend” Lenses bearing a personal inscription, a three-year warranty, and a 40% LCD token bonus. Equivalent contributions in cryptocurrency receive the same bonus. Lucyd is developing ergonomic smartglasses and a suite of apps to power them. The Lucyd blockchain platform will make it simpler to create, share and experience the AR content. It’s time to look up from your phone and see the world. To learn more please visit https://lucyd.co. Lucyd pte ltd is the source of this content. Virtual currency is not legal tender, is not backed by the government, and accounts and value balances are not subject to consumer protections. This press release is for informational purposes only. The information does not constitute investment advice or an offer to invest. The post LUCYD AND GRAVITY JACK FORM STRATEGIC ALLIANCE Gravity Jack to Provide Augmented Reality apps for Lucyd Smartglasses appeared first on Bitcoin PR Buzz. Bitcoin Press Release: Over X-Mas weekend, an organization called Acchain.org, itself overseen by the international decentralized Committee IDAXC (“International Digital Assets Exchange Council”), issued a press release commemorating yet one more successful milestone in its long-term business plan. Namely, the launch of an ICO to fund the “A-SDR,” a global basket of digital cryptocurrencies based on a similar model that the IMF has been working with for several decades. Whereas the IMF deals exclusively with banks within its own sphere, the emergent A-SDR is open to anyone looking to exchange or cross-settle transactions within the digital/fiat universe. Which, effectively, is everyone working in digital space. 6th January 2018, London, UK – In the original announcement, it was explained that ACCoin (“ACC”) — the top-tier or “fuel” coin supervised by the IDAXC — would form a 3-part “digital cryptocurrency basket” alongside Bitcoin and Ether. Offering ongoing, updated, exchange rates that were determinate and fixed worldwide. All to better “anchor” the three coins in a manner that would be transparent and open to anyone, anywhere in the world. Such a supra-national system, just like the IMF model on which it is based, would be the first and perhaps most important step for integrating the crypto (alt-coin) multiverse into the traditional (fiat) banking system. And would also be a necessity if (as many expect) sovereign nations decide to issue their own national coins or tokens in the days or months ahead. Why is such a Digital Basket Needed? What is ACCoin and why does it deserve to quantify Bitcoin and Ether? What is the upside for participants in the A-SDR ICO? Is the IMF involved with the A-SDR? “We simply borrowed a concept that had proven itself workable over decades, and retooled it to solve a pressing need in the crypto space. But aren’t there tokens already doing digitization? How does the A-SDR work? Are there any Early Adopters of the ACCoin Eco-System? Is Fiat (cash) required to participate in the A-SDR ICO? The post “A-SDR DIGITAL CURRENCY BASKET” Extends ICO Timetable An Extra 7-Days Due to “Overwhelming” Response appeared first on Bitcoin PR Buzz. Bitcoin Press release: Blockchain startup ETHMS is building a platform and infrastructure with ethereum technology to bring contractual agreements and cross-border services into the digital age. 6 January, 2017, Singapore – Tech startup ETHMS has announced its intention to implement blockchain technology through its ERC-20-based token to revolutionize the cross-border services market. The company is building an infrastructure based on ethereum technology to bring general services, contractual agreements and specifically cross-border services into the digital realm. The cryptocurrency market has had a banner year thanks to the meteoric rise in bitcoin prices and the huge popularity of initial coin offerings as a new way of fundraising. Many people are buying into new digital tokens with the assumption that those virtual currencies will appreciate over time at levels similar to Bitcoin, or its rival Ether. Market watchers have stated they expect more dramatic movements in the cryptocurrency market in 2018. As cryptocurrencies grow and expand exponentially, they are also beginning to take over the role of paper currencies. From cryptocurrencies being a form of investment for your Average Joe all the way up to your Wall Street superstars such as Thomson Reuters Corp, these people have all invested in cryptocurrencies. However, this year was especially unique with governments competing against one and other in order to become the next Silicon Valley of cryptocurrencies. With much of Asia adopting blockchain technology and other Nations creating the necessary infrastructure to implement such technology. Despite all these developments, there is one financial sector that cryptocurrency technology is lagging in and that is the use of cryptocurrencies in the services and contractual agreements, especially cross border services. However a solution lies in ETHMS, which uses the Ethereum Shares Token. ETHMS is also like an online marketplace that enables its users to exchange smart contracts. These include legal contracts, rental agreements, labor contracts, sales and so forth. Thus, enabling users from various professions and backgrounds to engage in the sale, purchase or exchange of contracts. For example, if someone has a labor contract that lasted for 12 months but only received 5 months of labor, they could then go onto sell the rest of the 7 months, possibly at a discount. Moreover, ETHMS aims to grant its users convenience as they offer templates of contracts which users could use and edit, thus giving an instantly legally binding contract for different purposes. Such templates would be created by law firms, lawyers or professionals in relevant sectors and sold on the exchange for a commission or a fee. Contractual templates will be stored in stockpiles and ready to be used at the users’ convenience. The ETHMS reduces the amount of overall hours spent creating contracts and also reducing storage costs. Despite offering obvious benefits such as anonymity, reduction of transaction costs and most importantly it offers security. ETHMS is based on the ERC20 platform, which provides a high level of encryption and security in the system. Through using ETHMS an individual will have improved security and addresses such concerns by enabling users to update, upgrade and authenticate when using their services. ETHMS is a marketplace for smart contracts. It enables its users to exchange, buy and sell contracts in an extremely convenient way. Allowing users to purchase contractual templates written by professionals within a matter of a few minutes. In addition to this ETHMS enables legal professionals to earn money and commission by selling contractual templates. Best of all, ETHMS uses Ethereum Share Tokens, offering its users anonymity, convenience and reliability. It also enables its users to audit smart contracts thus, most importantly improving security significantly. The post Blockchain Startup ETHMS is Implementing Ethereum Technology to Bring Cross-Border Services into the Digital Age appeared first on Bitcoin PR Buzz. 29th December, London, UK – Gimmer launched an Alpha version of the platform early in 2017 and has developed a range of special features for everyone, from experienced traders to complete beginners, making Gimmer uniquely positioned to launch automated cryptocurrency trading into the mass market. How will Gimmer change the crypto trading world? Gimmer’s platform will open up the world of automated crypto trading to a whole new sector of traders. Experienced traders will be able to build trading strategies and rent them out via Gimmer’s bot store, providing them with a passive income. This will appeal to traders familiar with cryptos but will also bring in experienced traders from outside the crypto sector who will see an opportunity to apply their skills to a new market. Novices don’t need to spend days learning the subtleties of each cryptocurrency, they can simply rent a bot with a pre-programmed trading strategy built by another trader or pick one built by the Gimmer team, some of which will utilise AI technology. These bots will make it easy for the mass market to become involved in automated crypto trading – all they need is an account with an authorised exchange. Currently, only a few platforms offer automated trading but they also require expert programming skills and knowledge of the cryptocurrency market, only providing solutions for a small group of experienced cryptocurrency traders. Gimmer will revolutionise the market, using AI and trading bots that have the capability to create and test different strategies and will recommend, based on the user’s risk profile, the best most profitable trading bot strategy. This will also take the emotion out of trading. What is the Development Plan? This will include decentralising Gimmer and releasing it as a DAPP so that it is cheaper and faster to use and gives users the ability to run multiple bots at the same time. The team will also create the automated arbitrage and automated lending bots and a mobile app in 2018. The development team is experienced in fintech, private equity and trading and come from sectors across the globe, bringing international cross-industry expertise to the Gimmer project. “There are no other crypto trading websites in existence that can do the things Gimmer can do. It is unique because it’s not only an automated platform, it also enables the development of advanced market prediction rules running as a decentralised app on one simple platform with many features to earn money potentially for every type of crypto trader. Philipe Comini, Co-founder and CEO of Gimmer said. The post Next-Generation Crypto Trading Platform Gimmer Announces Token Sale appeared first on Bitcoin PR Buzz. Bitcoin Press Release: Brands create customer loyalty programs to attract new customers and attempt to maintain them yet, they are often difficult to cash in or lost in the disarray amongst dozens of loyalty cards or online memberships. Moreover, customers’ personal information is exclusively held and managed by brands when they subscribe to one of these loyalty programs. 4th of January 2018. The enormous threat to consumers data privacy reduces trust between consumer and brands. Customers can’t be sure how the brands will use all personal information or who else will have access to it. To provide a solution, Sandblock is developing the Satisfaction protocol, a decentralized protocol to create an autonomous consortium and connect brands and customers together. The protocol is based on Smart Contracts on the Ethereum blockchain, it utilises a tradable token, the Satisfaction Token (SAT), which reduces the friction and costs to join the consortium. By enforcing SAT’s rules prevents any actor from concentrating too much power and thus bending the system to its advantage Using the Satisfaction protocol, brands can guarantee real data privacy for customers thus protecting the customer, as well as helping brands to be in accordance with the latest regulations regarding data privacy. In order to reach a large audience and beyond crypto enthusiasts circle, Sandblock is developing a mobile application dedicated to customers. Using this application, customers can easily manage this new kind of crypto assets. It allows customers to use them, trade them and more importantly, earn them directly from their favorite shops by making purchases. The application is under closed alpha testing at this time however, will be soon introduced to the public for an open beta test phase. By transforming all the individual brands rewards into blockchain based tradable crypto-assets, Sandblock’s platform makes it possible to create truly global loyalty program. The low transaction fees enables savings that make it possible to offer much more in terms of rewards. What’s more, the flexibility of the protocol means that new marketing such as loyalty programs can be invented to better match customers’ expectations. Sandblock leverages the natural and well known volatility of crypto currencies, by creating a base value (Satisfaction Token), for all Branded Tokens. As this volatility seems inevitable, the Sandblock team found a way to minimize this risk and let all the brands and customers benefit from the value created by entering the protocol. This allows a real value to be kept for all customers’ assets even when a business fails to keep its promises. Sandblock is a technology startup based in Paris, France and have been working for the past 6 months on developing this new ecosystem. Formed by a multidisciplinary team of experienced professionals in digital marketing and software engineering, Sandblock leverages the power of the blockchain to usher in a new age for the relationships between businesses and their customers. The company will issue the Satisfaction Token (SAT) during a token generation event during the first quarter of the year. The company will issue the Satisfaction Token (SAT) during a token generation event during the first quarter of the year. Although the dates have not yet been announced, Sandblock are offering a 15% token bonus on the first day, and a 10% bonus on the second day of the TGE. Over the next 10 days of the TGE, Sandblock will be offering a 5% bonus on tokens. The soft cap has been set at 2,700 ETH with a hard cap of 8,000 ETH. The post Sandblock – Disrupting Loyalty Programs and Customer Engagement Using the Blockchain and Cryptocurrencies appeared first on Bitcoin PR Buzz. Bitcoin Press Release: Industry veterans to consolidate market share, focus on B2B gaming technology. The move will synchronise strengths held by each party to create a highly dynamic unit. Panama City, Panama – January 3nd 2018 – Two of the most recognized names in online crypto gaming have formally announced a merger in a deal that brings together the long-standing and profitable suite of Monster Byte’s crypto gaming products with the vast experience of MoneyPot’s cryptocurrency web wallet with API connections to scores of applications. With Monster Byte’s pioneering efforts in provably fair Bitcoin gambling and the innovative history of MoneyPot’s global casino bankroll and cross-application currency transfers, the Monster Byte team is now enhanced with additional team members, each bringing unique value and skills to the tech firm. With the merger concluded, all current MoneyPot investors are to be informed of an 8-week period during which they can perform a full withdrawal of any funds from the public MoneyPot bankroll. After integration has completed, the bankroll will be reopened for investment at a timeframe to be announced. More than a historic partnership, the merger means that Monster Byte will be able to leverage on new synergies that places it in a position of strength on various fronts. Market Share: While immediately benefiting from the market share boost of combined user bases, Monster Byte expects an increase of market share, helping capture its target of 5% global industry share by 2019. Furthermore, in an industry that suffers from high player attrition, a larger community continuously engaged by variety, involvement and interaction will serve to improve player loyalty. Friendly Wallet Client: Players will have access to a powerful yet simple multi-coin wallet portal to use for gaming needs. Monster Byte most recently has begun integrating new ‘alt-coins’ onto the various gaming platforms they own, and with this merger, will now have further technology to expand deeper into both the ‘altcoin’ gaming and exchange verticals. Syndication: Monster Byte has been working diligently towards syndicating its Sportsbook and Casino software through white label gaming and direct API access. Now, with MoneyPot under the Monster Byte umbrella, entrepreneurs can immediately tap into both Monster Byte and MoneyPot solutions to provide best in class offerings to clients without having to develop the product or service themselves. Backed by sound business planning and management, Monster Byte has been a profitable venture for many years and will look to build on this solid foundation going forward. With its new capacities, Monster Byte will now shift its focus in 2018 to its business-to-business (B2B) operations, showcasing all its games and technology on its flagship property BitcoinRush.io. Direct casino and sportsbook API access for developers to build their own gambling portals or sportsbooks funded by their own bankroll. MoneyPot API access to build casinos on top of MoneyPot APIs accessing a global bankroll. Whitelabelling to manage custom casinos leveraging Monster Byte games. Token or Altcoin listing on the MoneyPot network for open trading and gambling on various MoneyPot enabled portals. Established in 2013, Monster Byte Inc. is a Panama-based technology company which specializes in the creation of B2B gaming software which is leveraged by several well-established cryptocurrency gambling platforms, including BitcoinRush.io, the world’s first Bitcoin Sportsbook and Provably Fair Casino. MoneyPot is a versatile cryptocurrency web wallet that connects end users to multiple applications, primarily casinos that operate on top of the MoneyPot API and global bankroll. It is currently being redeveloped as a multi-currency wallet for gaming components, with cryptocurrency exchange feature for trading alternative digital assets. The post Monster Byte Acquire MoneyPot in Historic Crypto-Gaming Merger appeared first on Bitcoin PR Buzz. 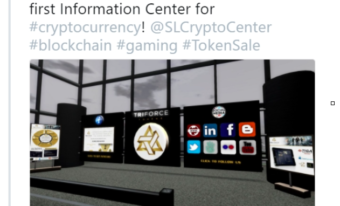 Bitcoin Press Release: Blockchain gaming company TriForce Tokens is proud to be featured in popular game Second Life, as part of its in-game Cryptocurrency Information Center. This accompanies the approaching release of TriForce Tokens’s new RaidParty mobile app, planned for launch before the next token sale on February 20th, 2018. January 3rd, 2018 Milton Keynes, UK – With the backing of Coventry University and Innovate UK, blockchain gaming tech firm TriForce Tokens continues to power ahead with its goal of creating a blockchain-based digital ecosystem for the online gaming community, with the dates for its next token sale finalized and its new mobile gaming app RaidParty close to completion. TriForce Tokens have also recently decided to rename their token from the old name of TFT, to FORCE token. The team behind Triforce Tokens is also working hard to raise the platform’s profile, diligently refining marketing efforts to ensure better prominence and awareness of its mission to lead the revolution of the multi-billion dollar online games industry through innovative use of blockchain technology. In an exciting update, Second Life has now included an information stand inside its virtual Cryptocurrency Information Center. Potentially millions of Second Life users can now learn about Triforce Tokens FORCE Tokens and the revolutionary concept of a decentralized digital gaming ecosystem behind it. In addition, Triforce Tokens has now partnered with premier marketing consultancy Look Touch & Feel, with whom it is working closely to deliver on token sale commitments, ensuring the project achieves the widest possible outreach. The Triforce Tokens PR team will also continue to provide ongoing support to place FORCE Tokens on a number of top-tier online media outlets. With several private investors expressing interest, Triforce Tokens is also in the midst of finalizing new deals that will widen its horizons, with more exiting updates to come. Triforce Tokens is actively developing its RaidParty mobile application, due for a beta release shorty before the next token sale. The mobile app will be embedded in the Triforce Tokens blockchain network, enabling gamers, developers and streamers to socially engage and honour each other through a rewards system. As the product approaches finalization, Triforce Tokens will share more details, focusing on delivering real word utility and adoption of FORCE Tokens. Based on advice and consultation with new partners providing critical marketing support, Triforce Tokens has decided to launch its next token sale event for February 20th, 2018. This will run for two weeks ending on March 6th, 2018. A total of 1.5 billion tokens (1,500,000,000 FORCE) will be put up for sale at a base price of 1 ETH = 6,000 FORCE, with a soft cap target of 1,600 ETH. A discount structure bound to supply will apply, as detailed in the updated whitepaper and website. As the sale begins with a 25% discount on the first 1% of supply, the earliest contributors are likely to benefit from better discounts. Following this, a final main token sale event will be announced in February 2018. Acting on recommendations from industry experts, Triforce Tokens will immediately release FORCE tokens to contributors at the conclusion of the final main token sale. This will coincide with the listing of FORCE on several authorized exchange platforms, allowing holders to trade them after the end of the public crowd sale. FORCE Tokens will be the currency powering payments and rewards on the decentralized gaming ecosystem. TriForce Tokens has ambitions to become the first fully-compliant UK ICO, and is working on ISO27001 certification and General Data Protection Regulations (GDPR) compliance. TriForce Tokens has signalled a clear intent for its revolutionary platform, by partnering up with some of the industry’s most recognized advocates. It is a full member of the games and publisher network, TIGA, whose core purpose is to strengthen games development and digital publishing. It is also a corporate member of Swiss-based Crypto Valley Association. Triforce Tokens has also partnered with Coventry University Enterprises Ltd for corporate and business cooperation, while initiating an IP audit with the UK government’s Innovate UK for its technology and brand. TriForce Tokens’ vision of a decentralized platform addresses the prohibitive barriers of market entry, particularly for independent developers. TriForce Tokens will offer developers a way to rapidly deploy common features across any platform and any game, such as tournaments, P2P trading and peer ranking. Instead of replacing existing revenue models, TriForce Tokens ooks to expand on unexplored streams, with a harmonising ecosystem of digital wealth across all platforms. Players can use TriForce tokens to trade with others or earn them as rewards for competitions. Developers can compensate players with tokens for completing tasks and charge their own fees for P2P transactions. The transparency afforded by TriForce Tokens will also foster happy, safe and ethical communities, where a unique honour system will recognize players for collaboration and assisting others. To improve player retention, TriForce Tokens also assists developers with providing novel gaming experiences, using big data crunching and behavioural analysis to provide deep player insights. TriForce Tokens’ blockchain solution also promises an authentication network to help developers minimise piracy concerns, while also allowing them to extract some revenue from pirated content. TriForce Tokens is the source of this content. Virtual currency is not legal tender, is not backed by the government, and accounts and value balances are not subject to consumer protections. This press release is for informational purposes only. The information does not constitute investment advice or an offer to invest. Bitcoin PR Buzz has been proudly serving the PR and marketing needs of Bitcoin and blockchain tech start-ups for over 5 years. Get your own professional Bitcoin Press Release. Click here for more information about Bitcoin PR. The post TriForce Tokens Blockchain Gaming Readies New iOS and Android App as Dates Confirmed for Next Token Sale appeared first on Bitcoin PR Buzz.